1Departamento de Ciencias Básicas y Aplicadas, Universidad Nacional del Chaco Austral (UNCAUS), Comandante Fernández 755-Presidencia Roque Sáenz Peña, Chaco, Argentina. 2Laboratorio de Microbiología de los Alimentos (UNCAUS), Consejo Nacional de Investigaciones Científicas y Técnicas (CONICET), Argentina. 3Instituto de Química del Noroeste Argentino (INQUINOA-CONICET), Universidad Nacional de Tucumán. Argentina. 4Cátedra de Química Orgánica y Biológica, Facultad de Ciencias Naturales e IML y Facultad de Bioquímica, Química y Farmacia, Universidad Nacional de Tucumán, Ayacucho 471, San Miguel de Tucumán, Tucumán, Argentina. 5Instituto de Botánica del Nordeste IBONE (CONICET), Sargento Cabral 2131, Corrientes. Argentina. Context: Some species of Bignoniaceae are widely used in medicinal practice by the natives of South America. 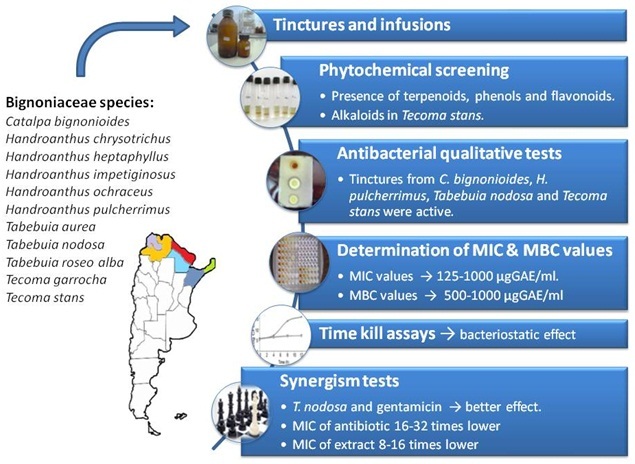 Aims: Tinctures and infusions from twelve tree species of this family were evaluated for in vitro antibacterial activity against pathogenic bacteria. The effect of interactions between the four most active extracts and conventional antibiotics was also evaluated. Methods and Material: Bioautography and disc diffusion methods were used to select the most active extracts, then agar macrodilution and broth microdilution method were used to determine the minimal inhibitory and minimal bactericidal concentration (MIC and MBC). Time-kill assay and checkerboard method were employed to determine the type of antimicrobial effect and synergism, respectively. Results: It could be determined that tinctures from Catalpa bignonioides, Handroanthus pulcherrimus, Tabebuia nodosa and Tecoma stans were able to inhibit bacterial growth. The MIC and MBC observed were between 125-1000 μg GAE/ ml and 500-1000 μg GAE/ml, respectively. The tested extracts were more effective against Gram-positive microorganisms. Time-kill experiments indicated bacteriostatic activity. Phytochemical screening showed terpenoids, phenols and flavonoids. Alkaloids were detected only in Tecoma stans. Among these combinations, the best was Tabebuia nodosa extract plus gentamicin. In most cases, MIC values were reduced 16-32 times for antibiotics, and even 8-16 times for extracts. Conclusion: These results revealed that some of the selected combinations could efficiently inhibit the growth of tested strains at lower concentrations than those required for the lonely use of the antimicrobial. These extracts would improve the efficacy of antibiotics against resistant bacteria, hence they could be used for anti-infective therapy. Keywords:Checkerboard method, Fractional inhibitory concentration (FIC), Gentamicin, Tabebuia nodosa, Time-kill experiments. Analía TC, Beatriz NM, Inés IM, Paola CM, María GA, Catiana ZI. Antibacterial Activity of Tinctures from Tree leaves belonging to the Bignoniaceae family and their Synergistic Effect with Antibiotics. Pharmacognosy Journal. 2015;7(6):400-405.